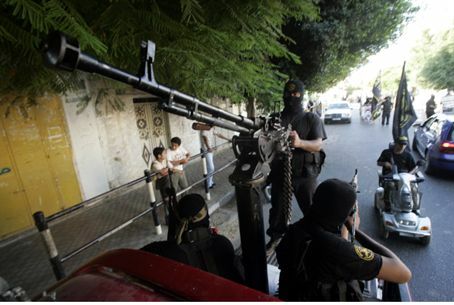 Terrorist rivals challenging Hamas’ control of Gaza may blow up the ceasefire reached last week, Voice of America reports. Hamas has agreed to an informal truce, negotiated by its Muslim Brotherhood ally that rules Egypt. The two principal triggers that can put a violent end to the truce are the Islamic Jihad and the Salafists. The Islamic Jihad, founded by followers of the Muslim Brotherhood, has its own army of approximately 1,000 terrorists, according to VOA. The Salafist groups are an even more likely threat because of their attempt to portray Hamas as “liberal” in terms of Islamic law and the Al Qaeda goal of a pan-Islamic caliphate, which is the stated goal of Iran. Salafist terrorists have accused Hamas of not being aggressive enough in its war against Israel and often have launched rocket and missile attacks on Israel without coordination with Hamas. They also have staged attacks on Internet cafes and Christian centers in Gaza. The Jaish al-Islam cell of Salafists kidnapped BBC reporter Alan Johnston in 2007 in a failed bid to secure the release of an al-Qaeda cleric detained in Britain. “The leader of another group, Jund Ansar Allah, openly defied Hamas by declaring an Islamic emirate in Gaza in 2009,” VOA reported. Hamas retaliated in a battle that killed at least 27 peole in the two terrorist organizations. Hamas has an advantage over other terrorist groups by having created an army of an estimated 10,000 fighters, with other estimates reaching 20,000. However, Hamas could be the victim of traitors and experience the same fate that it dealt to the rival Fatah terrorist group in 2007, when it ousted it from power in Gaza in a bloody militia war.